Points : 17 out of 20. One of the originalities of the group ILLUMION is the fact that it is mostly female. The vocals,for its part, is only female. And it is not, for that matter, without recalling the voice and intonations of Kate Bush. The effect of this feminine side are felt throughout the melodies that are rather calm and soft, which has nevertheless a certain nervousness of often rock tempos, subtly mixed to the sensuality and the delicacy of the vocals. ILLUMION gives us Symphonic Prog of very good technique. Musically, one can describe it as coming close to The Gathering, Magenta or well again Ayreon. The interpretation is of a high level, and some pearls can be discovered with the passing of the pieces, notably the very original Chinese 4 string lute. The compositions are original, avoiding the predictable banalities and the familiar formulas, and come out again so invigorated and inspired. 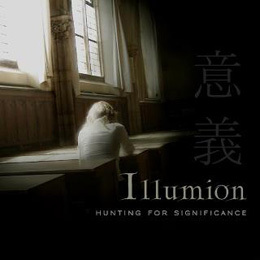 ILLUMION: a group to be discovered.